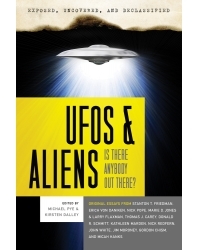 Exposed, Uncovered, and Declassified: UFOs & Aliens strives to address all of these questions—and more—by covering new evidence of famous sightings and contact with aliens, and uncovering classified files from world-class collections and archives—all courtesy of the world’s leading experts on modern ufology. Nuclear physicist and world-renowned UFO expert Stanton T. Friedman discusses how close we really are to interstellar travel. Erich von Daniken, father of the ancient astronaut theory, discusses the possibility and evidence of ancient hybrid creatures created by visiting god-like aliens. Nick Pope, former member of the British Ministry of Defence, covers the latest UFO documents released by the UK’s National Archives, including such fascinating information as: what Churchill knew, why the documents are being released now, what’s in them, and what’s still being withheld. Donald R. Schmitt, the former co-director of the J. Allen Hynek Center for UFO Studies, takes on the aftermath of the Roswell incident, discussing in detail the initial stages of the government’s cover-up attempts. Air Force veteran Thomas J. Carey chronicles the military’s attempts to intimidate people into not telling their stories about what they have seen with their own eyes. The niece of Betty and Barney Hill, Kathleen Marden, gives a short history of cases of alien abduction, many which continue to baffle the American public and UFO investigators alike. Nick Redfern provides a fresh take on the famous 1953 UFO crash in Kingman, Arizona, and explores its possible connection to a government program to reverse-engineer alien spacecraft. Something is out there, and Exposed, Uncovered, and Declassified: UFOs & Aliens will help us find out exactly what—or who—it is.